A couple of years ago, when Microsoft suggested that Office users would see new features in the cloud first, this seemed to apply to the server products like Exchange and SharePoint. Those are cloud services where Microsoft can do the usual cloud experimentation of trying a new feature with a group of users and seeing how well it works before making it widely available. That's the same 'flighting' process that's happening with Windows 10 – first the product team, then other Microsoft employees, and then volunteers try out the features before they're released to the public. For Office 365 that's the First Release program, and increasingly it includes new features in the Office applications as well. If you've been using Office 2013 with an Office 365 subscription, you will already have some of the features that are new to other Office 2016 users, like being able to record what you're doing on your computer and include that in a PowerPoint presentation (because that was added to PowerPoint 2013 as an update). And if you've been using the Office Online web apps that are part of OneDrive and Office 365 business subscriptions, the Tell Me and Smart Lookup features in Office 2016 will also seem rather familiar. In fact, Office Online first got the Tell Me interface for finding specific features in January 2014, in what was then called the Word Web app, and in April 2014 it arrived for Excel. Tell Me works in the same way in Office 2016 as it does in Office Online – start typing what you want to do (which can be a common word like 'horizontal' rather than a technical term like 'orientation') and you get a short menu of matching features. Some of the tools are more immediate in the online version – typing 'how many words' gets you a link to the Word Count dialog in both Word 2016 and Word Online, but Word Online also shows a fly-out with the number of words directly. It's not surprising that Tell Me showed up in Office Online first, and not just because the Office team can experiment with features more easily in a cloud service that's getting updates every couple of months anyway. 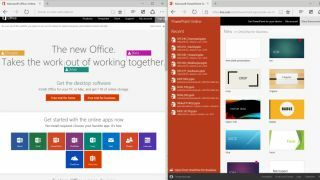 The Office Online apps have fewer features than the desktop Office programs (although they're getting more with every update), so building Tell Me would have been easier for a smaller set of features. The Bing Insights feature (which is what Smart Lookup used to be called) is also an obvious thing to put in the web apps first (it was added to Word Online in December 2014), because you have to be online to look up information from words in your document in the first place. Like the Office 2016 programs, Office Online uses the rest of your document to get more accurate results when you look up a word, and shows information from Wikipedia and other sources in the Insights bar at the side. There are some features that only work online, which is why Word 2016 hasn't quite caught up with Word Online. If you put an image containing text into a Word document, you won't find that text when you search the document. But if you save the document to OneDrive, the text in the picture will be recognised and indexed (although not immediately) and you'll see it if you search inside the document in Word Online.